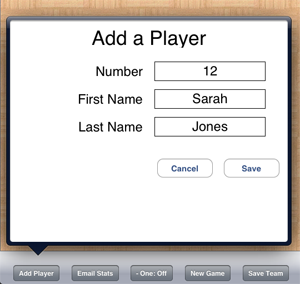 Tap the Add Player button to enter each of the players on your team. Enter the number, first, and last names of all your players, saving each as you go. If you want to edit a player's name or number later, simply tap their jersey.You can also delete a player with this pop-up. Tap the choose stats button to configure the app. Select the jersey color of your team. Select which of the optional stats you want to track for this team. Simply turn them on or off. Turning on optional stats will enable the button for that stat in the box score. Enable tracking of the opponent's stats. Simply turn on opponent's stats and you will see a summary line to track your opponent's stats at a summary level. To save a team for the first time, tap the Manage Teams button, select Save As in the team list, and type the name of your team into the New Team box. To save changes to	a team you have previously saved, select the team name from the list and tap save. When you save a team, each player's name and number, optional stats, and jersey color will be saved. To save a second team, make sure that your first team and any games are saved. Tap on Manage Teams and tap “Clear Team” to clear out any players you have currently. 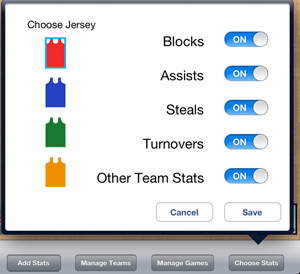 Then, simply add players via the “Add Player” button, choose your team’s jersey color and optional stats. When you are done, save your team the same way you saved the first one. 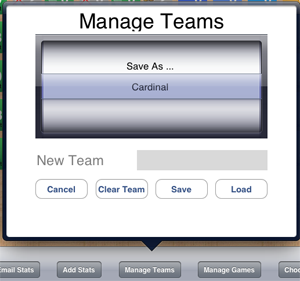 When you are ready to start a new game, simply tap “Manage Teams” and load up the team that you are keeping stats for. 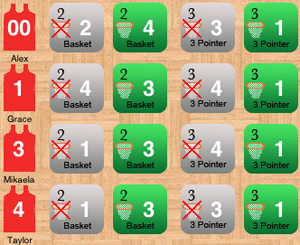 Simply tap the button each time your player makes or misses a shot, grabs a rebound, or commits a foul. As you capture stats, the player points, team points, and team fouls will increment. As your player gets in foul trouble (3 fouls), the fouls button will turn yellow. As they foul out (5 fouls), the fouls button will turn red. Enable opponent stats in the Choose Stats pop up, to track opponent stats at a team level. A summary stat line for your opponent will appear at the bottom of the screen with a grey jersey. Simply tap on each stat as it happens just like you do for each player on your team. The only difference is that these stats are at a team level. If you make a mistake, simply tap Add Stats to go into correction mode and fix any errors. Hit the wrong button? Simply go into correction mode by tapping the “Add Stats” button. You’ll notice it changes to “Subtract Stats” and turns green. You are now in correction mode, just touch any stat button to subtract one. When you are ready to start tracking stats again, simply touch the “Subtract Stats” button and it will turn back to “Add Stats” and go back to stat capture mode. It is important to save your stats from a game so that you will be able to pull them up again later to review or share them. When you are saving games, you will organize them into seasons. To save a game, tap the Manage Games button. With the season selector on Save as, you can type the name of a season into the New Season text box. You can then also type the name of the game into the New Game text box. Hit Save and your game will be saved. You can also save updated stats to a game you have previously saved. 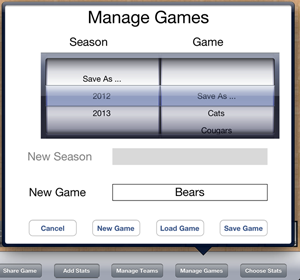 Simply tap Manage Games, select the season and game you wish to save the stats to, and tap Save. Click on share game to email detailed stats or tweet the game's score and a summary of the stats. Enter the name of your team and the name of your opponent's team. If you are not tracking your opponent's stats, simply enter your opponent's point total so that either the email or the tweet will have the game's final score. Once you have entered the team names and point total (if needed), simply tap the email or Twitter icon to share your stats. 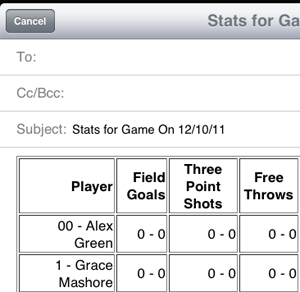 When your game is finished, share your stats with your team by simply emailing them out. you just press the Email Stats button and it will pull up a new email with the game's stats inside. This is also a great way to save stats. It's easy to copy the stats into an excel spreadsheet. 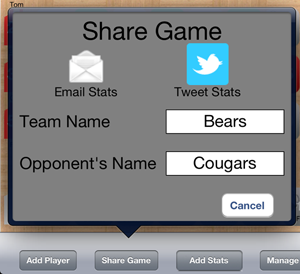 To share the game's score and a summary of your team's stats, simply tap the Twitter icon in Share Game. You must have at least one Twitter account configured in your iPad's settings. The Tweet will be pre-populated with the game score and a summary of your team's stats. You can edit any of the text in the Tweet before sending. Also, if you have more than one Twitter account set up on your iPad, simply tap the "from" account on the tweet to switch to a different account. To load a game you previously saved, tap the “Manage Games” button, select the season and game you’d like to load, and tap the “Load” button. This will erase any unsaved players or stats you have, so make sure you’ve saved anything you’d like to keep. To clear the stats for a team you have loaded so that you can start a new game, simply tap “Manage Games” and then tap “New Game”.